I first came across the dynamic duo of Aniece Meinhold and Cesar Zapata during what turned out to be a short-lived stint at Blue Piano. A charming little wine bar down the street from the Design District, it had occasional live music and an eclectic selection of wines and beers (courtesy of Aniece, who ran front of house) and small, tapas-style bites (courtesy of Cesar, who ran the kitchen). The food was simple but sometimes surprisingly creative, with a selection of charcuterie and cheeses rounded out by things like the "McLovin," an English muffin filled with chistorra sausage, melted cheese, chipotle cream, and a fried egg, with chicharrones on the side for good measure. There was a rift with ownership, and in August, Cesar and Aniece left the Blue Piano. Shortly afterwards, they popped up again with Phuc Yea!, a modern Vietnamese pop-up restaurant downtown. I had several excellent meals at Phuc Yea!, and was sorry to see it go after its three-month run. Aniece and Cesar quickly resurfaced, this time with their very own full-blown restaurant, The Federal. Joining them this time around is Alejandro Ortiz, an industry vet who previously worked as sommelier in some of Miami's top restaurants. In a departure from the Southeast Asian flavors of Phuc Yea!, the Federal returns closer to home. Styling itself a "Modern American Tavern," both the venue and menu have something of a gastropub feel to them: simple, rustic, but done with flair and style. What started as a nondescript strip mall space now has real personality and warmth, mixing old-timey cabinetry, a patchwork of wallpaper, odd bits of taxidermy and other bric-a-brac. Mismatched serving pieces range from pewter plateware to repurposed Shoney's Blue Plate Special dishes; Ball jars serve as candle-holders. You can eat at the bar, covered with salvaged wood planks and lined with old leather belts; at one of several tables inside, including a picnic bench set up for larger groups or banquettes tucked cozily under the windows; or outside on a makeshift patio, which does the best it can with the vista of a parking lot overlooking Biscayne Boulevard. The place now has the same instantly nostalgic feel as an Instagram photo. The Federal's menu is broken up primarily into "Bits," "Starts," and "Big'Uns." It nods to nostalgia as well - biscuits and gravy, sausage and mash, fisherman's stew - but is by no means rigorously old-fashioned or traditional. The first item on the list of "Bits," their biscuits, brushed with honey and topped with a crust of cheddar cheese, skew closer to the dense crumble of a scone than to the cloud-like fluffiness of puff pastry, though that's not a criticism, just a description. One of my favorite starters was a crudo of scallops, sliced thin and macerated in a reduced blood orange glaze, scattered with slivered watermelon radishes, tiny greens, smoked trout roe and BBQ potato chips. It's an unusual-sounding combination which would seem to run the risk of overwhelming the scallops, but managed to achieve a successful balance of sweet-sour-smoky-briney flavors. It's also light enough to leave you plenty of room for the "Big'Uns" that follow. Buffalo Style Pig Wings, meanwhile, are quite a bit more than a "Bit." A clever piece of butchery and marketing, these "wings" are actually a cut of the rear shank of the pig, trimmed to provide a plump knob of pork attached to the fibula bone. Braised til tender, fried til crisp on the outside, a couple of these then get some classic "Buffalo" flavors - infused with some hot sauce somewhere along the way, served over a blue cheese mousse, topped with julienned strips of pickled carrot and celery. Do it right and it's hard to go wrong with these flavors, and these are indeed done right. But this is also a substantial enough dish that you might find your appetite sated rather than piqued once you get to your main course. The "Jar-O-Duck" is likewise perhaps better meant to be shared. It's not a huge serving, but this ramekin of textbook silky, unabashedly fatty duck rillettes is rich stuff. Personally, I could easily pass on the doubly sweet pairings of charred marshmallow fluff and candied sweet potato, but I can also concede their appeal. Possibly even better - and an even heartier starter - is the wild boar sausage (made for the Federal by Proper Sausages, I believe) served with pan-roasted mushrooms over some truly excellent whipped potatoes. The "Fifth Quarter" is well represented among the starters: you can get crispy pig ears with a root vegetable hash and a fried Lake Meadow Farm egg; you can get those biscuits topped with a sweetbread gravy (closer in flavor to chicken potpie than southern sausage gravy); you can get beef tripe, fried and sprinkled with bbq spices and drizzled with maple syrup. But the attitude towards offal comes off as ambivalent: on one hand, there's plenty of it on the menu. But on the other, there seems to be a concerted effort to disguise it. Both the pig ears and the tripe are shredded, breaded and fried virtually beyond recognition; it could be just about anything underneath the blonde gravy in which those sweetbreads are smothered. Indeed, the crispy tripe goes by not one but two euphemisms - first the ambiguous "Crispy Beefy Bits," then the unfamiliar "omasum." Those who aren't fans of organ meats of any kind can just stick with a salad and still fare quite well. 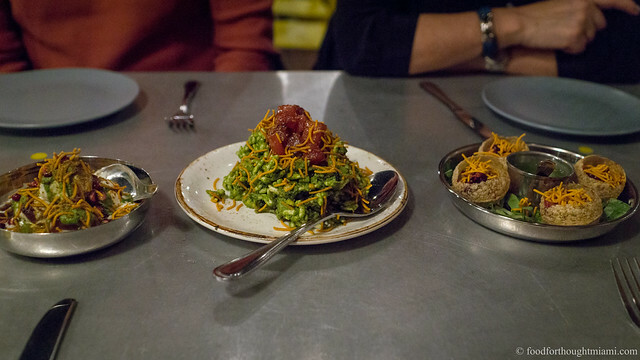 The "Federal Salad" features a perky mix of fresh greens, whatever radishes happen to be growing, a shower of crispy fried onions, and a perfectly balanced vinaigrette made with whiskey-barrel vinegar. It's the kind of dish that makes me reconsider my long-held antipathy toward salads generally. A recent addition to the menu - white asparagus, topped with smoky speck and a runny poached egg, drizzled with a citrus oil - achieved the same kind of balance of bold bright flavors without being overwhelmingly rich. That speck also makes an appearance on a well-curated list of charcuterie and cheeses that can be assembled into a platter of your choosing. On an early visit, a "Pot-O-Mussels" steamed in lager with tasso and "stuff" was disappointingly bland. But more recently, a similar preparation with clams was much improved - the bivalves plump and just cooked, the broth heady with a mix of oceanic and porcine flavors. Another recent daily special of spicy Creole shrimp served over a crispy grits cake likewise offered a lighter, but still flavorful, alternative to some of the heavier starters. The "Big'Uns" tend to be pretty straightforward. There's a gastropub-ish take on steak frites with grass-fed Angus steak paired with hand-cut fries; a roasted baby chicken with cornbread stuffing; a simple grilled fish with an herb salad and pickled key limes. More interesting is the Short Rib "Wellington" - a fancy name for what is really just a pot pie (a somewhat fancy pot pie, admittedly). A rich stew of braised short rib, it's studded with bacon, mushrooms and pearl onions, possibly enhanced with some foie gras fat, and crowned with a burnished dome of puff pastry. The Federal's burger is likewise an updated spin on a classic comfort food: more potently flavored lamb is subbed for the beef, creamy goat cheese replaces the usual melted slice, horseradish mustard and chow-chow relish add some tang, and a pretzel bun gives some heft and chew to the package. The "Fisherman's New Amsterdam Stew" seems to have all the right pieces - tender fish, scallops, mussels and clams, swimming in a shellfish and tomato broth along with some new potatoes, carrots and baby corn - but never quite came together as a finished dish. Still, if some of the "Big'Uns" don't quite match up to the "Bits" and "Starts," the good news is that you can easily treat many of those heartier starters as an entrée and have a very satisfying meal. "Sweet'Uns" at The Federal usually include a short selection of baked goods, as well as one or two examples of a recent trend, desserts in a jar. One of the best, trendy or not, is the "S'mores in a Jar," a dense, bittersweet chocolate pudding (enhanced with some coffee if I'm guessing right), topped with a sticky layer of bruleed marshmallow fluff and served with graham crackers for dipping and scooping. You don't get to roast your own on a stick in the campfire, but there's a significant upgrade in refinement. A similarly structured lemon meringue pie was just as good, while pecan sticky buns come to the table warm and practically oozing with sticky glaze. There's even more baked goods to be had if you go to The Federal for Sunday brunch, when several of the regular menu items are rounded out with more breakfast-y type items like a "Jackalope Benedict" (their biscuits, topped with rabbit and venison sausage, poached eggs and hollandaise sauce), and "Wabbit and Waffles" (fried rabbit and waffles with kumquat butter and smoked maple syrup), along with an abundant spread of pastries and other "Sweet'Uns". If that's not enough inducement, then perhaps $14 Bottomless Mimosas might be. Any tavern should have a good selection of beers and wines, and The Federal benefits from the combined wisdom of Aniece and Alejandro, both of whom really know their beverages and seek out the unique and unheralded. There are around a half dozen beers on tap - stuff like Shiner Dortmunder Saison, "Sweaty Betty" blonde wheat beer from Boulder Beer Co., and Cigar City Maduro brown ale - supplemented by an equally eclectic selection of bottles. And while there's a thoughtful selection of wines by the glass or 375ml carafe, ask for the "Wine-Keep List" for a broader selection of wines, with some truly esoteric finds like the 2004 Movia Ribolla, a biodynamically produced Slovenian white wine that balances a rich, buttery mouthfeel with bright citrus and an intriguing nutty hint of oxidation (you can read more about Movia here). The "Modern American Tavern" is just one more iteration of the ongoing "casualization" of fine dining: get quality ingredients, cook them with care and flair, skip the white tablecloths and fine china, and hold the prices down enough so that it can be a once-a-week experience rather than once in a blue moon. That's what they're doing at The Federal: making good food without making a federal case out of it. Which previously has been home to Canela Café and, very briefly, Kantauri Seafood Restaurant. It reminded me very much of one of the places we visited in Portland last summer, Ned Ludd. In fairness I suppose "omasum" is actually the opposite of a euphemism, being the term for the third chamber of a ruminant stomach. On our first few visits I found that the menu skewed a little too much in the direction of really rich, heavy dishes: am I really going to order a sausage and whipped potatoes as a starter, and follow up it with a short-rib wellington pot pie? Could I possibly get biscuits topped with sweetbread gravy, and then a lamb burger, and live to tell the tale? But as The Federal has gotten a couple months under its belt - and as the temperatures start to climb - I see signs that the menu is lightening up some. Recycling a tweet here, but I once saw a burlesque act called the "Bottomless Mimosas." The "tavern" idea seems to be in the air these days. Some other examples from much more well-known chefs include Tyler Florence's Wayfare Tavern in San Francisco, and José Andrés' conversion of Café Atlantico into America Eats Tavern, which features updated versions of historical recipes culled from, among other places, the National Archives. Perfect review, great pictures, can't wait to try this place. I love the crudo at L'Artusi and I always have a hard time choosing which ones I want. I decided to try my hand at making one yesterday when I got these delicious scallops at the store. The food is very good at this place, no qualm there. However it disappoints me to encounter a place not located in the Design District, Midtown, Downtown or Sobe that has very comparable prices. i believe if I am going to dine at a nondescript commercial strip on the fringes of a questionable neighborhood, I should expect the price point to reflect these facts. I believe that this part of the equation should not be overlooked by The Federal's team. You forgot to mention the amazing soundtrack. I love, love The Federal.